What a stunning setting for this fabulous villa, the ideal size for the tropical holiday of a lifetime for a small family or two couples! On the south west coast of Koh Samui is a private beachfront headland, and here nestles a very small, exclusive group of villas enjoying glorious views across the ocean and private access to the white sand beach below. 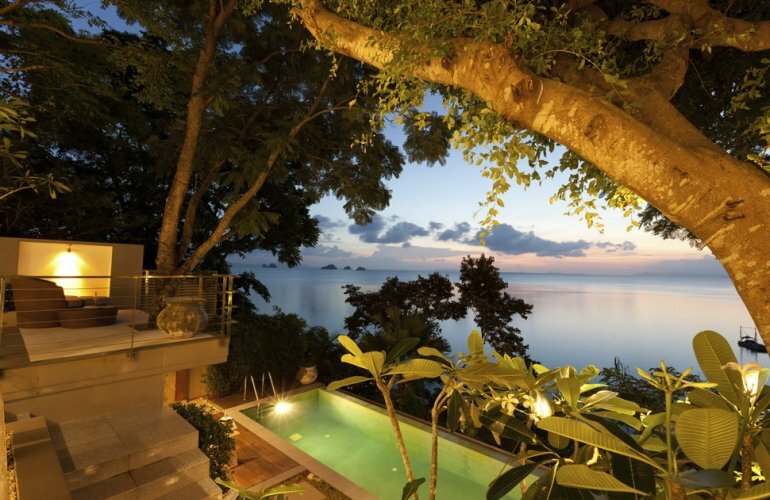 This small community of just six luxury villas at tranquil Taling Ngam beach is located on a headland offering 180 degree panoramic ocean views across the Gulf of Thailand to the mainland, taking in the Five Islands and Ang Thong National Marine Park. This is a spacious two bedroom villa perched on an incline above the beautiful white sand beach, giving guests a light, bright and tastefully stylish holiday home with stunning sunset views, a private infinity edge pool and modern, cool decor. Koh Samui is not a huge island, and all that it has to offer visitors is within easy driving distance from the villa. Designed to fit and complement the land on which it sits, the villa shrugs casually at the opulence and ostentation of some, offering instead subtle luxury, natural materials, light furnishings and a collection of stylish artefacts. The living and sleeping pavilions of this villa are fully air conditioned, and there is complimentary Wi-Fi access throughout. Entering the grounds you are immediately within a pretty garden, on one level of which is the infinity edge pool, lawn and a sun terrace furnished with a parasol and sun loungers. Steps from the pool lead up to the next level on which are situated the two thatched pavilions, for living and sleeping, with views onto the pool and the ocean beyond. The open plan sitting, dining and kitchen area is the first pavilion. It has a high vaulted ceiling, and full height glass folding doors on three sides so that the whole area can be opened to the tropical sea breeze and create an outstanding entertainment venue. The lounge and the elegant dining table can accommodate six in comfort. The kitchen is fully equipped for guests to provide their own in-house refreshments with ease, and features a white island breakfast bar with integrated appliances. Above the kitchen area and approached by a staircase reached from the walkway at the back of the kitchen, there is a mezzanine TV lounge with sofas and an LCD satellite TV/DVD system. This room also has spectacular views. There is a covered terrace to the front of the pavilion, and a pathway leading round to the sleeping pavilion which is set a little bit back from the living areas. A garden bathroom with WC and shower is located at the rear of the kitchen. The sleeping pavilion enjoys the same high ceilings and thatch roofing as the first pavilion, and it houses the two en suite bedrooms, with a covered terrace at the front. The first bedroom has a large four-poster white-netted bed, and a walk-in shower in the en suite. Doors from here lead to a private courtyard garden. The second guest suite has two single beds and a similar walk-in shower in the en suite, and access to a private courtyard garden. There is a loft area to this second bedroom, reached by a ladder, which can be used as an additional sleeping area. Both bedrooms have built-in wardrobes, and of course stupendous views.